With decent regularity pro-Morsi supporters have conducted small protest marches around our Maadi neighborhood since his removal from office in July 2013. They do not tend to be violent but usually result in ugly graffiti insulting now-President Sisi. Recently, new graffiti has emerged, calling the people to ‘man up’ and protest on January 25, the anniversary of the original revolution. 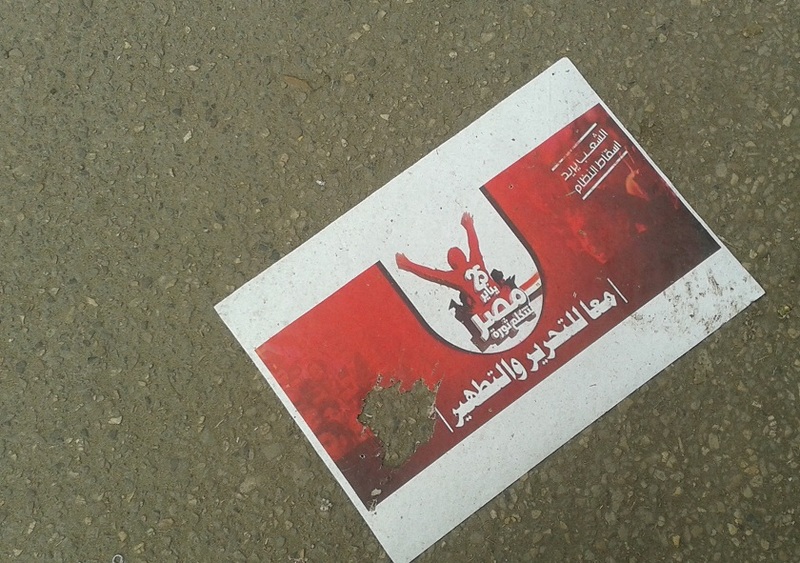 And this past week I noticed posters – on the ground – calling for a new uprising. The translation reads: Together for liberation and purging; The people want the fall of the regime; and 25 January, Egypt speaks revolution. I do not yet have a good feel for whether or not people will respond. A recent effort to rally an Islamic revolution failed dramatically to attract numbers. But what is significant to me about this poster is that it is printed in color. This means there is money behind the effort. Another version was even more colorful, but was in poorer condition. Also significant is that it was on the ground, stomped upon. I did not see any such posters anywhere on the walls. Were they torn down? Did residents or police prevent their hanging? January 25 is a week away. It will be interesting to monitor developments.